This particular one is technically a supermassive black hole, which means it has at least a million times the mass of the sun. Well okay then, supermassive makes sense as an adjective, doesn’t it? They tend to appear in the center of galaxies—most galaxies, in fact—and they help promote the birth of new stars. Supermassive black holes help astronomers learn about the evolution of the galaxies around them. The spin provides clues about its own history, much as rings of tree trunks do. So when astronomers chart the spin patterns of a black hole, they can learn about the galactic collisions that result in the accumulation of material. The way a black hole spins indicates the matter around it, both in terms of amount and where it’s come from, which helps astronomers learn about the surrounding galaxy. 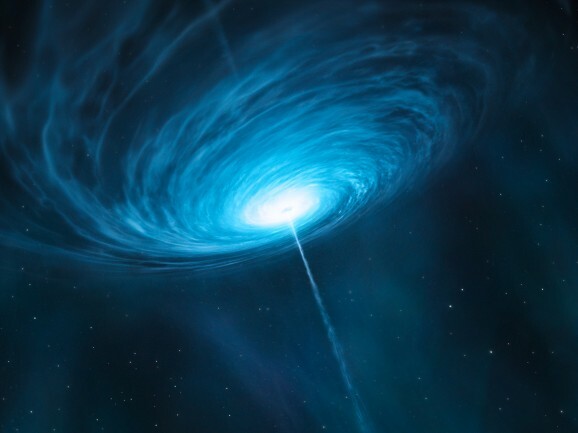 If we want to get technical about it, what the astronomers see is actually a quasar, which occurs when a bunch of material falls into a supermassive black hole. Normally, we wouldn’t be able to see this kind of quasar so far away, even with the help of Hubble, but this one happens to be aligned with a giant nearby galaxy that helps make it visible. 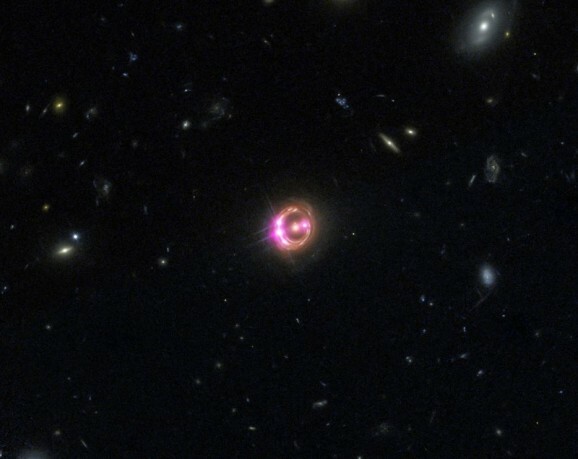 Gravitational lensing helps too, which is the magnification of light from objects as they pass by something massive. Simply looking at a Tilt-A-Whirl makes me nauseous, so it’s now hard to imagine supermassive black holes without feeling a little dizzy. But I have to admit it makes them even cooler, no matter what Stephen Hawking says.